Get the latest Event News,Networking Tips and Special Offers! ​Enjoy the only event if its kind. The Charge Station™ is the place to be to make meaningful connections with empowering individuals while having fun! We change the theme for each event to keep you engaged and excited for the next. while you mix and mingle with amazing people you will discover new ways to leverage your internal GPS through LIVE sessions and interactive techniques. This will leave you with a roadmap for accomplishing your goals for 2019. ​Make meaningful connections. Embrace a community that helps catapult your growth to success and HAPPINESS. Exchange ideas and resources with like-minded professionals. 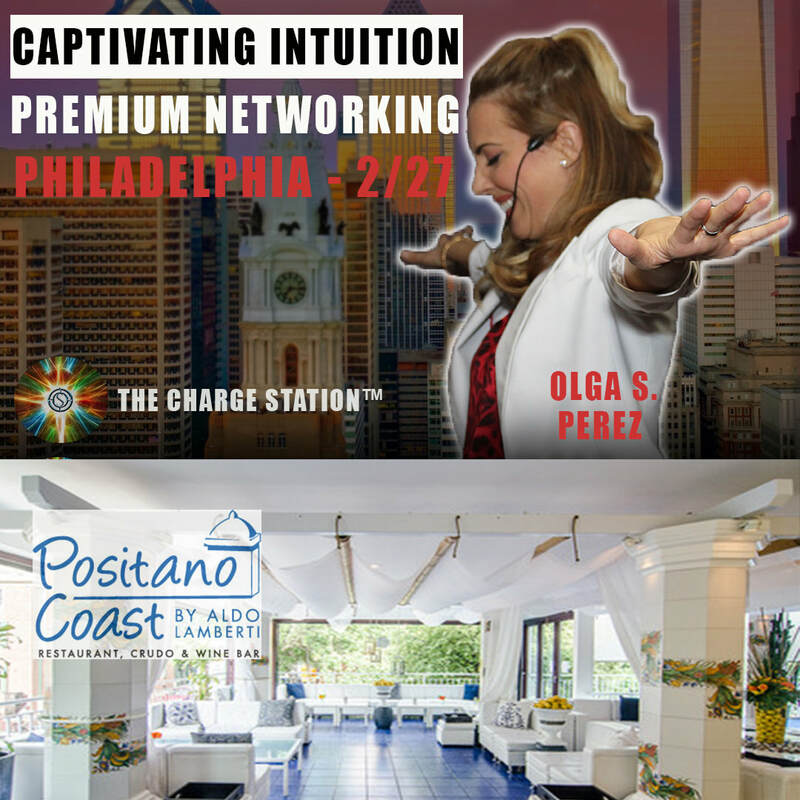 Allow yourself to be uplifted and empowered by the host and International Life Strategist Olga S. Perez, who will motivate and uplift you with real life stories and immeasurably valuable insights for your empowerment. Olga specializes in helping others find their happiness, and giving people the confidence and ENERGY to accomplish their dreams. *Tickets include beverage specials and entry to raffle prize giveaway. ⚡️Early bird tickets ALWAYS sell out, so get your ticket now! ​Olga S. Pérez founded The Charge Station™ with one goal — to give people the tools for Self-Empowerment. ​An expert on the psychology of self-love with over 20 years of experience helping individuals achieve their best self, Olga has developed winning strategies for personal and professional transformation. Business leaders, parents, celebrities, artists; people from all walks of life have found a friend and mentor in Olga. Through her writings, broadcast media appearances, speeches, live events, and one-on-one coaching sessions, she has played an influential role in the lives of more than 1,000 people from several different countries. Olga has launched two successful business ventures, won numerous awards, and has devoted thousands of hours volunteering for individuals, corporations, and foundations. As a speaker, Olga translates life into fun and relatable analogies, which inspire confidence and leaves attendees eager to apply what they’ve learned. “What began as a desire to help close friends improve the quality of their lives, has grown into a lifelong mission to give everyone tools they need to turn their lives around"